An old-school hardback and beautiful embossed ship. 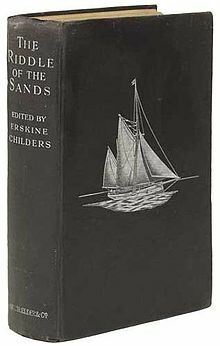 The Riddle of the Sands was published in May 1903, and it has probably sold more than two million copies in its lifetime. 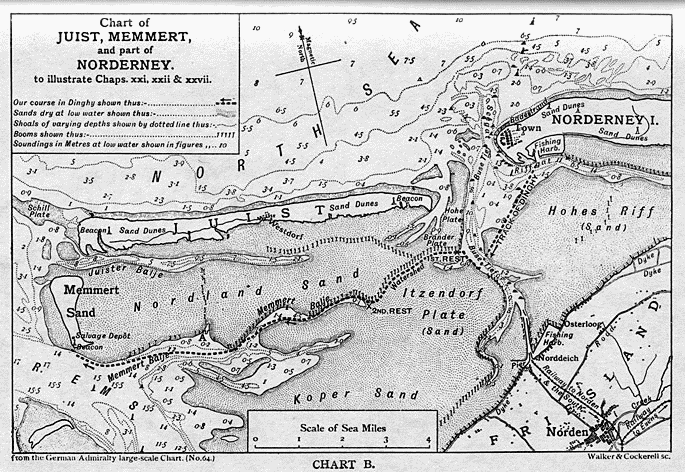 Its author Erskine Childers was infuriated when it was described as fiction, because for him the issue of a probable German invasion by sea was real and the danger obvious. Many reviewers at the time disagreed as to exactly what the book was. The Scotsman’s reviewer ‘hesitates to class it in the category of fiction’; St James’ Gazette called it ‘a breezy and thoroughly entertaining romance’. Other readers took it as a manual for national defence. In 1910, two British naval officers, Captain Trench and Lieutenant Brandon, were charged and found guilty of espionage at a trial in Leipzig, and executed. 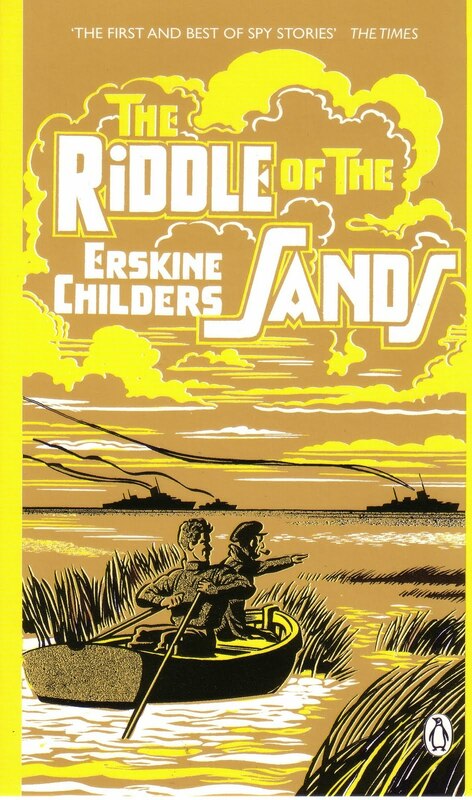 A copy of The Riddle of the Sands had been found in their belongings in Borkum (one of the towns featured in the novel), which Lieutenant Brandon enthusiastically admitted to having read three times. John Keegan wrote in 2004 in the TLS that ‘The Riddle of the Sands and The Thirty-Nine Steps remain key texts to the understanding of British attitudes towards intelligence’. 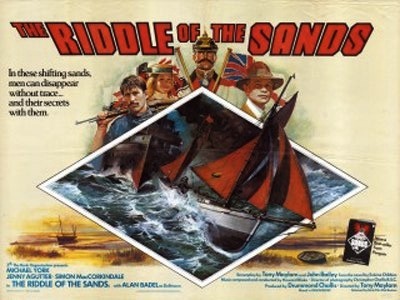 As part of the tradition of novels from the school of physical endurance, originating in Robert Louis Stevenson’s Kidnapped (1886), The Riddle of the Sands redirected adventure writing into new channels. John Buchan’s The Power-House (1913), and his Richard Hannay novels in particular, show a clear descent from The Riddle of the Sands. The disguises and undercover work are the clear forerunner of everything that Richard Hannay and Peter Pienaar did in Buchan’s The Thirty-Nine Steps, Greenmantle (1916), Mr Standfast (1919) and The Three Hostages (1924). Captain W.E. Johns’ Biggles stories also have a debt to Childers. Biggles’s sphere is in the sky, not the sea, and he is resolutely military, but his disguises and his struggles of physical endurance, in and out of war, go straight back to these English sailors, searching for clues in the fog on the sandbank. The theme of the novel is the relationship between Britain and Germany, in language, loyalty, and states of aggression. Carruthers the Foreign Office civil servant is summoned by his old school friend Davies to help untangle a mystery that Davies has stumbled across while doing some dangerous sailing off the German coast, because Carruthers speaks German ‘like a native’. Carruthers listens to the daughter of the man Davies suspects, and he guesses that, although she has probably spoken German since childhood, Clara Dollmann is an Englishwoman. Davies’ German is terrible, but he forges his way through technical conversations with seamen and woos Clara with dogged inaccuracies. The German locals enjoy trying their English words out on the Englishmen, but the old Danish lady refuses to speak German at all, and reduces conversation attempts to silence. She is a living reminder of an older German invasion, of Denmark in 1864, foregrounded here by the hidden threat in the present, only gradually comprehended by the Englishmen. The Riddle of the Sands shows what relations between Britain and Germany were like before the First World War. Davies the passionate sailor is enthusiastic about the Kaiser, soon to be reviled in British popular fiction as the devil incarnate. ‘That Emperor of theirs is running it for all it’s worth. He’s a splendid chap, and anyone can see he’s right’. The organisation of Germany’s industrial power is deeply impressive. ‘For two days we travelled slowly up the mighty waterway that is the strategic link between the two seas of Germany. Broad and straight, massively embanked, lit by electricity at night till it is lighter than many a London street; traversed by great war vessels, rich merchantmen, and humble coasters alike, it is a symbol of the new and mighty force which, controlled by the genius of statesmen and engineers, is thrusting the empire irresistibly forward to the goal of maritime greatness’. The casual dipper-in might balk at the amount of sailing in The Riddle of the Sands. They shouldn’t, because sailing is necessary to make the plot work. Boats run aground and can go nowhere until the tide returns, so the characters must find another way around their difficulty. Secret channels in the sands can only be found when the tide is high, and knowledge of these is power. Sailing is the only way of getting to the islands, where the secret lies. The ability to use boats in fog is a secret weapon. You don’t need to be a sailor to enjoy or even understand this story. It probably helps to know that a binnacle and a mizzen are part of a boat, and that ‘taking soundings’ tells you how much water is between you and the seabed, but The Riddle of the Sands can be enjoyed wholly without having ever sat in a boat. Erskine Childers’ talent was to go straight to the point, describing exactly why the elegant Carruthers felt such a useless waste of space on his first trip out, or how the skill of his friend, the socially awkward Davies, saved his life in the storm off the Hohenhorn. The charm of the book comes from reading about the wet, salty, chilly and aching physical work of sailing, and how enjoyable it is, once it’s over. Childers was completely happy at sea in a small boat, and this enthusiasm makes his writing come from the heart. Childers was the subject of five separate biographies in the 1970s alone, followed by a film of The Riddle of the Sands in 1979. In the mid-1990s there was another wave of interest in his life with two more biographies, and a ‘continuation’ of the adventures of Carruthers and Davies. Some of these works are focused on his sailing, some on his Irish Republican politics, but all begin with The Riddle of the Sands. This novel transports you back in time. You won’t get wet or salty, and your arms won’t ache with rowing, and you won’t crash your head or bark your shins against inconvenient parts of the Dulcibella, but you will get lost in this spying mystery as invigorating and stimulating as the choppy North Sea. An excellent review of an excellent book! A wonderful book! I first read as a young teenager and still reread it 60 years later.